PG Job Site mobile application makes finding job & staff member easy, no matter if a jobseeker & employer are at their workdesk or on a playground with their kids. 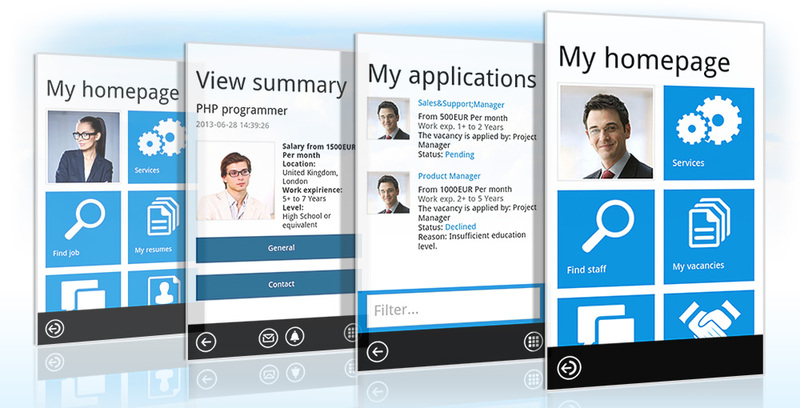 PG Job Site mobile application is optimized for the most popular mobile platforms - Android and iOS. This will allow you to cover a significant portion of your site users. PG Job Site web interface has been radically rethinked. Inteface of the mobile application has been adjusted for mobile devices, including use of informative tiles, finger-friendly icons and buttons and more. JS mobile application is more than a search tool. For jobseeker, what's the point of finding jobs on the mobile app? Let a jobseeker go one step further and actually apply for a job with a saved resume, see the application status, contact employer - just like on the website! Why would an employer download the mobile app? To review received applications, contact jobseeker - just like on the website! Your brand name, color scheme & copyrights - all these changes are included in the JS mobile application and will be provided with the application after purchase. Are you looking to monetize the mobile application? With JS mobile application you can display ads that match your site user's interests. You will be able to eam from clicks and impressions. Where are your mobile application users coming from? What do they do on the application? How much time do they spend working with it? With JS mobile application, you can use analytic tools to learn your mobile audience and take appropriate actions. The package includes changing title to your brand name, color scheme to your site colors; adding keys for tracking analytics and displaying mobile ads. c) compile the application for any other mobile platform. Do you expect more from the application? We can help you! Contact us with your requirements and we’ll estimate the modifications.